All attempts to reform the Status Quo of advanced finance-based Capitalism will fail, as its historically inevitable crisis is finally at hand. It is self-evident that conventional economics has failed, completely, utterly and totally. The two competing cargo cults of tax cuts/trickle-down and borrow-and-spend stimulus coupled with monetary manipulation have failed to restore advanced Capitalism's vigor, not just in America, but everywhere. All those fancy equation-based econometrics that supposedly model human behavior have failed because they are fundamentally and purposefully superficial: they are incapable of understanding deeper dynamics that don't fit the ruling political-economy conventions. Marx predicted a crisis of advanced Capitalism based on the rising imbalance of capital and labor in finance-dominated Capitalism. The basic Marxist context is history, not morality, and so the Marxist critique is light on blaming the rich for Capitalism's core ills and heavy on the inevitability of larger historic forces. In other words, what's wrong with advanced Capitalism cannot be fixed by taxing the super-wealthy at the same rate we self-employed pay (40% basic Federal rate), though that would certainly be a fair and just step in the right direction. Advanced Capitalism's ills run much deeper than superficial "class warfare" models in which the "solution" is to redistribute wealth from the top down the pyramid. This redistributive "socialist" flavor of advanced Capitalism has bought time--the crisis of the 1930s was staved off for 70 years--but now redistribution as a saving strategy has reached its limits. The other political-economic strategy that has been used to stave off the crisis is consumer credit: as labor's share of the economy shrank, the middle class workforce was given massive quantities of credit, based on their earnings and on the equity of the family home. The credit model of boosting consumption has also run its course, though the Keynesian cargo cult is still busily painting radio dials on rocks and hectoring the Economic Gods to unleash their magic "animal spirits." The third strategy to stave off advanced Capitalism's crisis was to greatly expand the workforce to compensate for labor's dwindling share of the economy. Simply put, Mom, Aunty and Sis entered the workforce en masse in the 1970s, and their earning power boosted household income enough to maintain consumption. 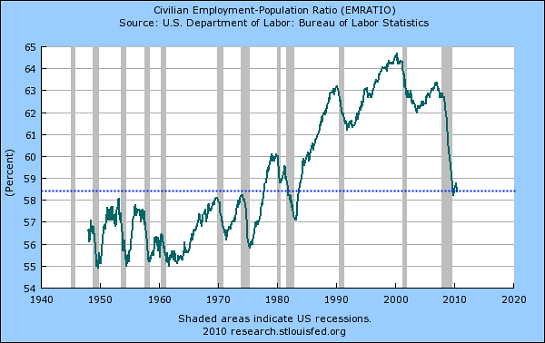 That gambit has run out of steam as the labor force is now shrinking for structural reasons. Though the system is eager to put Grandpa to work as a Wal-Mart greeter and Grandma to work as a retail clerk, the total number of jobs is declining, and so older workers are simply displacing younger workers. The gambit of expanding the workforce to keep finance-based Capitalism going has entered the final end-game. 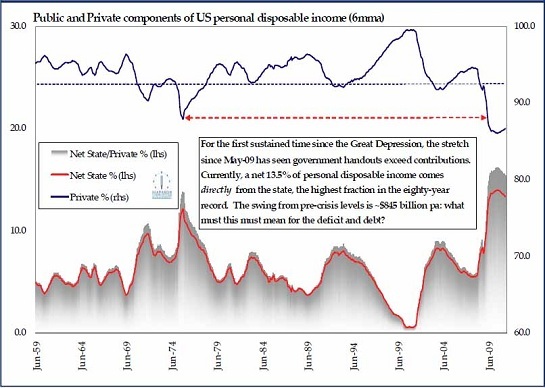 Moving the pawns of tax rates and fiscal stimulus around may be distracting, but neither will fix advanced finance-based Capitalism's basic ills. The fourth and final strategy was to exploit speculation's ability to create phantom wealth. By unleashing the dogs of speculation via a vast expansion of credit, leverage and proxies for actual capital, i.e. 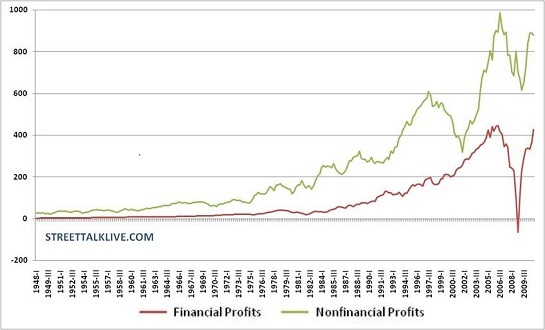 derivatives, advanced finance-based Capitalism enabled the expansion of serial speculative bubbles, each of whcih created the illusion of systemically rising wealth, and each of which led to a rise in consumption as the "winners" in the speculative game spent some of their gains. This strategy has also run its course, as the public at last grasps that bubbles must burst and the aftermath damages everyone, not just those who gambled and lost. Two other essential conditions have also peaked: cheap energy and globalization, which opened vast new markets for both cheap labor and new consumption. As inflation explodes in China and its speculative credit-based bubbles burst, and as oil exporters increasingly consume their resources domestically, those drivers are now reversing. Advanced Capitalism is broken for reasons conventional economics cannot dare recognize, because it would spell the end of its intellectual dominance and the end of the entire post-war political-economic paradigm that feeds it. Let's look at some charts to see what conventional economists must deny to keep their jobs. Take a look at this chart. What reality does it reflect? A failure to cut taxes enough? A failure to print enough money or extend enough credit? No. What it reflects is labor's dwindling share of the economy. 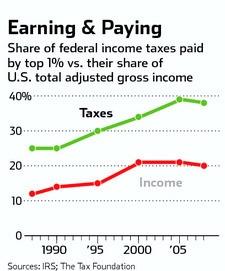 By at least some measures, the top 1% are paying a greater share of total taxes than they were 20 years ago, which suggests that "tax the rich will solve everything" stopgaps have limited purchase on the deeper structural ills of advanced finance-based Capitalism. 1. Global Capital has the means and incentive to keep labor in surplus and capital scarce, which means that capital has pricing power and labor has none. The inevitable result of this is that wages, as measured in purchasing power, fall while the returns earned on capital rise. This establishes a self-reinforcing, inevitably destructive dynamic: once labor's share of the national income falls below a critical threshold, labor can no longer consume enough or borrow enough to keep the economy afloat with its cash and credit-based consumption. We are at that point, but massive Federal borrowing and transfers are masking that reality for the time being. 2. The dual forces of competition and technology inevitably drive down the labor component of all manufactured goods and technology-based services. Mechanization, robotics and software have lowered the labor component of everything from running shoes to computer chips from $20 per item to $2 per item, and that process cannot be reversed. While the wage paid to the workforce designing and manufacturing the products and providing the services may actually rise, the slice of revenues given over to all labor continues shrinking. This is what I have constantly referred to (using Jeremy Rifkin's excellent phrase) as "the end of work." Put another way: the return on capital invested in techology greatly exceeds the return on labor. Industries and enterprises which fail to leverage capital invested in technology that lowers the labor component of their good/service eventually undergo rapid and inevitable creative destruction. We are about to witness this creative destruction in the labor-heavy industries of government, education and healthcare. Marx's genius was to recognize the historical inevitability of these internal forces within advanced Capitalism. He also recognized the inevitability of finance-capital's dominance of industrial capital--something we have witnessed in full flower over the past 30 years. Finance capital now dominates not just industrial capital but the machinery of governance, rendering real reform impossible. Instead, the Status Quo delivers up simulacrum "reform" which change nothing but the packaging of the Central State/Cartel Capitalism's exploitation and predation. Add all this up and you have to conclude the final crisis of finance-based advanced Capitalism is finally at hand. All the "fixes" that extended its run over the past 70 years have run their course. Life will go on, of course, after the Status Quo devolves, and in my view, ridding the globe of financial predation and parasitism will be a positive step forward. The real solution is to understand advanced finance-based global Capitalism will unravel as a result of the internal dynamics described above, and be replaced with an economic and political Localism that I describe in my new book An Unconventional Guide to Investing in Troubled Times.I don't claim these ideas are unique to me; many others have described the same dynamics and historical trends. If this recession strikes you as different from previous downturns, you might be interested in my new book An Unconventional Guide to Investing in Troubled Times, now available in Kindle ebook format. You can read the ebook on any computer, smart phone, iPad, etc.Click here for links to Kindle apps and Chapter One. My new book An Unconventional Guide to Investing in Troubled Times is available in Kindle ebook format. You can read the ebook now on any computer, smart phone, iPad, etc. Click here for more info about Kindle apps and the book. Thank you, Robert B. ($50), for your staggeringly generous contribution to this site -- I am greatly honored by your support and readership. Thank you, Marianne M. ($50), for your outrageously generous contribution to this site -- I am greatly honored by your support and readership. The notion that better engineering can solve all our problems is rooted in an ignorance of non-linear systems and selective/wishful thinking. I recently received an email from a Chastizing Retired Engineer (CRE) that reflected both a ubiquitous spiritual disease and a profound ignorance of the limits of engineering. What fired the CRE's undimmed rage was my long analysis which explained why the economy isn't going to generate 20 million jobs, and that as a result, we need a Plan B, which I also outlined: Getting 20 Million Unemployed Back to Productive Work: Here's How (August 16, 2011). The CRE began by criticising the length of the entry, and by expressing the heartfelt wish that I was poorly paid for my writing. What does it say about the state of the nation's spiritual and intellectual health when retired engineers start their critique by hoping those they disagree with are subjected to poverty? The spiritual illness at the heart of this sentiment is a topic for another time. We might also wonder what's to become of the nation if retired engineers only want to read analyses of 250 words or less--perhaps because that is enough for them to decide the writer should be banished to poverty for the sin of disagreeing with their views. Though he obviously held his own intelligence and powers of observation in high regard, Mr. CRE apparently failed to notice that this blog is free, and thus I earn nothing directly from writing it. This further suggests a rush to judgment so spritely that the basic facts of the matter are skipped over as irrelevant. Mr. CRE recommended that I turn my attention to telling General Motors how to engineer the Car of the Future (COTF) and similar projects, presumably as a way of generating employment. In other words, the problem is a dearth of bloggers telling corporations how to design products of the future. That the solution to our collective problems is for bloggers to tell GM et al. how to design the Car of the Future is certainly a novel idea, but it overlooks several key points. Is GM interested in the views of bloggers? Perhaps in terms of marketing their vehicles, but I doubt they are seeking engineering advice from bloggers. GM undoubtedly has many experienced, talented engineers, some of whom designed the Chevy Volt as The Car of the Future, or at least as a car aimed at the future. The design parameters of the Volt were dictated by GM management, which is probably even less interested in the advice of bloggers than GM engineers. There are a number of other assumptions of interest in Mr. CRE's recommendation.One is that the Car of the Future needs to be designed, and another is that the Car of the Future would go a long way toward solving our unemployment problems. Some in GM reckoned they've already designed the Car of the Future with the Volt. Some at Nissan reckon the all-electric Leaf is the Car of the Future. (Both manufacturers sold about 2,200 of these models in the first 5 months of 2011.) Those working at Tesla clearly believe their next production car is the Car of the Future. The latest model is the XL1 which achieves 260 miles per gallon and a top speed of 99 miles per hour with a two-cylinder turbo-diesel engine (47 horsepower) and electric-drive assist. By comparison, my 1998 Honda Civic weighs about 2,400 pounds, has a 1.6 liter ICE (internal combustion engine) that generates 106 horsepower. On our recent camping trip, we drove 2,400 miles and despite climbing above 4,000 feet on five occasions and using the air conditioner, the car achieved 39.91 miles per gallon (total gasoline consumption 60.5 gallons). This is roughly comparable to the mileage of the far more costly and complex Toyota Prius, and about double the mileage of the U.S. fleet average of 19.8 MPG. The point here is that behavior and common-sense engineering can double the efficiency of the existing fleet without any new fancy (and costly) technologies. All of which is to say that there are already many competing designs for the Car of the Future, and it is the marketplace and external factors such as fuel cost and availability that will decide which wins, not retired engineers, executives at GM or bloggers. Clearly, the ICE (internal combustion engine) is intrinsically inefficient compared to an electric motor, as a huge percentage of the energy consumed by an ICE is lost to heat and friction of its many moving parts. Just as clearly, a Car of the Future that relies on composite materials and complex technologies will not be cheap to manufacture. There are a few other assumptions implicit in Mr. CRE's view that are questionable.Will building the Car of the Future generate millions of jobs? If Mr. CRE has toured any advanced auto factories, he would note that most of the work is performed by software-controlled robotic machines. At some plants in Japan, the total workforce is about 500 people. While there are certainly many jobs provided down the supply chain, the idea that building the Car of the Future will generate millions of jobs is simply fantasy. Software and robots are replacing human workers everywhere, even in low-wage nations like China. Indeed, we can guess that Mr. CRE was not a software engineer, as he doesn't seem to grasp that software is munching through industry after industry, hollowing out entire swaths of advanced economies while creating far fewer jobs than it has eradicated. If this concept is new to you, I recommend reading Why Software Is Eating The World. The larger question is how big a part the Car of the Future will play in the U.S. economy. Vehicle sales have plummeted from a record 17.4 million in 2000 to 11.5 million in 2010. Certainly the recession was a factor, but there are much deeper forces at work than recession: people are driving less, and more people are opting out of car ownership:The Road... Less Traveled: An Analysis of Vehicle Miles Traveled Trends in the U.S.. This is a global phenomenon. In Japan, the younger generation is not enamoured by auto ownership; rather, they view it as a costly burden. In analytic terms, we can chart this topping out and decline of miles driven and vehicle sales on a S-curve, as described by Cesare Marchetti in his seminal paper, A Simple Model for Complex Systems. Simply put, the entire vehicle industry is in decline for structural reasons beyond fuel costs. These include demographics, financial considerations, cultural values and other factors which cannot be adequately quantified by engineering methodologies. If the structural dynamics I described in the entry which so annoyed Mr. CRE do in fact play out, then we can also ask who will be able to afford to buy the Car of the Future other than the top 10% of households. If imported oil drops precipitously for a combination of non-linear and linear systemic reasons-- geopolitical upheavals, aging super-giant field production, rising domestic consumption in exporting states, etc.--then we might also profitably ask where the fuel will come from to power the 254 million passenger vehicles registered in the U.S.
2. Know-It-All Syndrome (KIAS), which is unfortunately endemic to a subset of the engineering community. The nostalgia for the mid-1960s is understandable. Back in those heady days, all the government had to do was throw unlimited sums of money at big engineering projects like putting a human being on the moon, and the engineers went to work and fashioned miracles. This is not an isolated example of engineering idiocy or KIAS. The entire premise of the engineering mindset is that problems can be broken down to a small set of quantifiable inputs, processes and outputs. This works fine when measuring and controlling water flow, flow of electrons, and other linear systems, but it is catastrophically mis-applied when Know-It-Alls besotted by their success in extremely limited linear systems attempt to "solve" non-linear problem-sets with linear "solutions." Case in point: war is highly non-linear. The "Whiz Kids" at the Pentagon did not even understand the problem-set, or the nature of war; how could their simplistic, Know-It-All "solutions" possibly work in the real world? Most of our problem-sets are non-linear, and are thus inaccessible to engineered solutions. Even something as straightforward as designing the Car of the Future turns out to be largely controlled by non-linear, impossible to quantify factors such as cultural values, future availability of fuel, etc. The very success of engineering in highly limited fields of endeavor feeds a hubris which is largely lacking in scientists schooled in life sciences. I wonder how much Mr. CRE knows about the human immune system, which is extremely complex, interactive, dynamic and non-linear in nature. I once pondered a chart of the basic immune system on the wall of a PhD immunologist friend; the number of "moving parts" and the interactions of those parts is mind-bogglingly large. The human immune system cannot be usefully mapped as an engineering project. This may explain why life scientists and others who work in non-linear systems tend to be circumspect about the applicability of their expertise in other fields. Meanwhile, quants in economics brim with confidence in their cargo-cult models of non-linear human behavior. No wonder the economists are so successful in "solving" our structural economic problem-sets. If we consider the stock market a problem-set, then shouldn't it be possible to engineer 11 good trades in a row? After all, the data is all there for the taking. If a whiz kid could engineer 11 trades that doubled the capital invested--not that impossible when trading futures contracts or options--then in 11 iterations a mere $500 blossoms into $1 million. So go ahead and engineer a "solution" to the stock market "problem" which yields 11 good trades in a row. The problem is that the market--and most of life--is non-linear, and "solutions" cannot be conjured out of simplistic linear models and inputs which cannot be quantified except with a highly illusory accuracy. Thank you, Margaret G. ($10), for your much-appreciated generous contribution to this site -- I am greatly honored by your support and readership. Thank you, Barney S. ($5), for your extremely generous contribution to this site -- I am greatly honored by your ongoing support and readership. Technological innovations can be helpful, but they won't solve our fundamental problems. For that, we will need social innovations. The explosive rise and global impact of technological innovation has persuaded us that technology is the ultimate solution to all our problems. This assumption is rarely questioned; it has become like the air, unseen and unexamined. The solution to the coming energy dislocation between supply and demand is technology: alternative energy, innovations in deep-oil recovery, etc. The solutions to our epidemics of declining public health (diabesity etc.) is more and better medical technology--more stents, more diagnostics, more medications, etc. The solutions to our problems in education is more technology: a laptop for every student, etc. The solution to a no-growth, jobless "recovery" is more technology. The notion that technological innovation is intrinsically incapable of "fixing" our problems is not just alien to our collective mindset, it is essentially sacreligious. In the current cargo-cult of technology worship, the basic assumption is better engineering can solve every problem. This includes social engineering, of course--"nudging" the populace to modify their behavior as deemed appropriate by the Central State, and punishing whatever populace veers away from the chosen path. 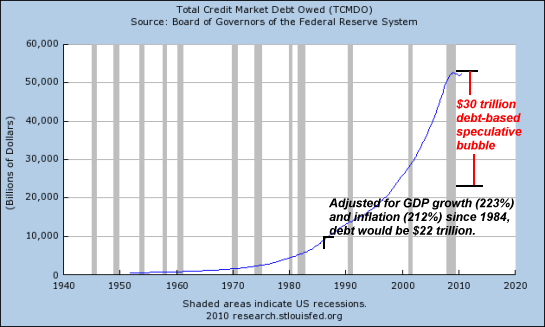 Thus we have two powerful cargo-cults influencing the American economy, society and government: the Keynesian "monetary easing," borrow-and-spend your way to permanent prosperity Cult of the Fed and its Keynesian priesthood, and the cult of technological innovation as the fount of all solutions. The idea that both these cults are the equivalent of the Mayan priesthoods which oversaw the decline and implosion of the Mayan Empire is not just an outlier--it is heresy of the first order. Ironically, perhaps, it is glaringly obvious that both cults will fail because they do not understand the problems and are automatically applying tools that cannot possibly fix what is broken: the three basic principles undergirding the American economy and society are crumbling, though that devolution is mostly hidden from view. You wrote: "Here is the ugly truth about the Savior State, welfare state, social welfare state, or whatever you choose to call the Central State: The Savior State displaces and destroys community and social capital. By making individuals dependent on the Central State for free money, free food, free housing, etc., then the State has taken over the natural function of community." Something I have noticed is that you are the only blogger who discusses the psychological effects of the current policies -- which are complete failures. Most people, especially young adolescents and young adults are desperately trying to express their independence and grow. The current system of protecting welfare state and monetary system status quo fiefdoms paradoxically depends on their physical participation while ignoring their psychological and emotional needs. The natural process of individuation is being subverted and its deleterious effects are bubbling to the surface. Indeed, true wealth is found in vibrant community. Vibrant community exists when the people in the community contribute (probably the most important ingredient in high self-esteem is self-efficacy), and have a sense of social responsibility. More simply, vibrant community exists when its participants feel they matter. Current policies, however altruistic its adherents and defenders may be, promote polarization (class warfare), and, most importantly, among those at the margin, especially in the young, poor mental health, which spills over in predictably unpredictable behavior. In short, current policies are anti-community and pro-sociopathic. Note to economists and social engineers: there is no algorithm that can express or replicate the heartfelt warmth and the bonds that are created and strengthened when a community voluntarily reaches out to help each other during difficult times. Note to big box corporations: I, and probably many more Americans miss the local bakery, butcher, clothier, grocer, etc. It was never just about stuff. It was more about stopping in and shooting the breeze over coffee, your kids playing on the same teams, it was and is about genuine mutual interest, the emotional context. They not only knew your name but knew you and you knew them. It's about the personal relationship. It's about community. A group of people without the ingredients of community is known as a mob. At some point I think we will come to realize that the reasons for a societal collapse are much deeper and more complex than people not buying enough Ford F-150's or assuming sufficient (whatever that means) debt. This is a deeply flawed argument. The laws of Thermodynamics tell us that we may control the rate of reaction of between finite resources but we cannot make more. If we do not expand beyond the bounds of earth it is inevitable that we will go backward as resources dwindle, but this need not be done so fearfully or chaotically. Everything human begins and ends in the mind. Wealth and poverty, both relative terms, are neither measure nor predictor of love and decency. I believe your background in philosophy better suits you to this discussion than many of the other bloggers out there. Most of them are basically quants and are predilected to thinking everything is solvable through an equation. But you seem to understand that human interaction is much more subtle and cannot be neatly packaged into a finite equation. If it is an equation at all, its variables change every few fractions of a second. Thank you, Harun. Yes, technological innovation can help solve some specific problems. But to believe that all problems can be distilled down to a technical solution is quasi-religious and ultimately self-destructive. For example, the skyrocketing cost of healthcare (sickcare) "innovations" will bankrupt the nation within this decade. That is not the view of some fringe, it is the conclusion dictated by the data. Meanwhile, the health of the populace arguably declines every year even as spending driven by technological innovation leaps up by hundreds of billions of dollars. I will be addressing some of the intrinsic limitations in the "engineering/tech is always the answer" mindset/religion in the next week, for it seems self-evident that while technological innovations could smooth the transition to a new economy and social order, the mere faith in technology is insufficient. We need new models for understanding our situation, and social innovations to match the technological innovations that are already in the works. Thank you, Geoff F. ($20), for your most generous contribution to this site -- I am greatly honored by your support and readership. Thank you, Gabriel M. ($10), for your very generous contribution to this site -- I am greatly honored by your support and readership. If we look only at charts and ignore the "news," we see storm pennants are flying in both the stock market and the U.S. dollar. The stock market is wearing a T-shirt that reads, "I broke a downtrend and all I got was this lousy pennant." Having just returned from nine glorious days camping in Washington State, I have no idea what "news" has effected the markets ("news" in quotes because the news is managed for its PR effect--the real news is what has been suppressed lest it undermine the Status Quo's carefully cultivated propaganda campaign), and so I have marked up the chart of the Dow Jones Industrial Average (DJIA) and the U.S. dollar without the "benefit" of the news flow. What pops out is a big fat pennant in both charts. Pennants can be continuation patterns--mere way points in a continuing up or down trend--or they can indicate points of trend reversals. The key feature of a pennant is the compression of price into a narrowing channel, as the relative indecision of buyers and sellers alike causes price to fluctuate less and less. At the apex of the pennant (note the triangle shape), the irresolution is resolved, usually in a big way up or down. If we look at the indicators in the chart of the Dow Industrials (Indoos), we note that the oversold conditions have been worked off, and a very bullish divergence in the MACD indicator (and a positive cross in MACD) has yielded up a meager pennant rather than a clear breakout or trend reversal. Even if you discount the "death cross" of the 50-day moving average (MA) dropping below the 200-day MA, a declining 50-day MA does not suggest a Bullish resolution to the pennant. That intersection of the 50-day and 200-day MAs offers up a tempting target for market Bulls. What should worry Bulls is that these positive moves in the indicators have yielded up such modest results--a pennant that is a week or two away from a potentially major break up or down. As for the dollar, the pennant may well be a sign of strength, as the Federal Reserve has been trying mightily to push the USD to a new low while propping up the euro at 1.44. 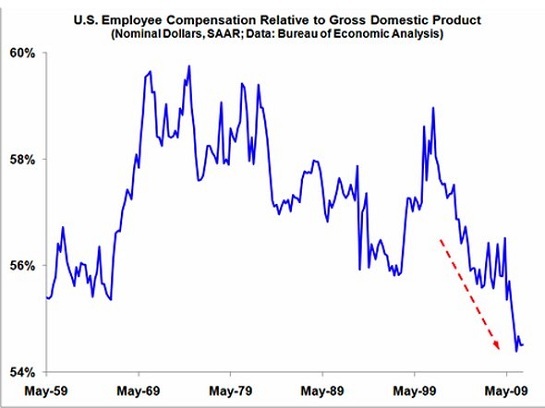 The basic reason is that a weakening dollar is the primary engine of U.S. corporate profits, as I explained in About Those Permanently Rising Corporate Profits... (August 12, 2011). If the Fed is unable to suppress the dollar via propping up the euro, then the entire stock market rally built on a falling dollar will collapse is a heap, shattering Wall Street's PR of permanently rising corporate profits. As noted in that entry, the euro and the dollar (as measured by the DXY index of weighted currencies) are on a see-saw; if the euro breaks down as a result of the eurozone's irreversable structural dilemmas, then the dollar will strengthen and the Fed's master plan of pushing stocks up via a weakening dollar will have failed. We have no idea how much treasure is being thrown into the fire to maintain the euro at 1.44 to the dollar, and that is the "news" which we must not be allowed to know, lest the extreme vulnerability of the eurozone financial Status Quo and the global rally were reflected in the foreign exchange and stock markets. Being completely out of the news cycle is a blessing, in more ways than one: not only is one's mind untwisted by propaganda passing as "news," one is free to look at charts without the carefully designed biases implicit in the "news." I am working my way through 400 unread emails and also unpacking and cleaning camping gear. Your patience and understanding are greatly appreciated. Thank you, Manjunath N. ($5/mo), for your most excellently generous subscription to this site -- I am greatly honored by your support and readership. Thank you, David L. ($10/mo), for your splendidly generous subscription to this site -- I am greatly honored by your support and readership. INTERVIEW ALERT: Chris Martenson was kind enough to interview me last week; thepodcast and transcript are on ChrisMartenson.com. Thank you, Chris and Adam, for the opportunity to discuss relocalization and withdrawing capital from Wall Street. The Fed has yet to learn that you can't fool Mother Nature for very long, and its punishing lesson has just begun. Did the Federal Reserve's QE2 program last year simply push the inevitable stock market decline forward a few months? It would seem so. In Remind Us Again Why Anyone Should Own Stocks For the Next Two Years (August 3, 2011) and The Junkie in the Pool and False Idols: Faith in Wall Street and The Fed Has Has Eroded (August 10, 2011) I included a chart of the current S&P 500 plotted against the two Great Bear Markets of last century, the Great Depression-era Dow Jones Industrial Average (1929 crash) and the Nikkei stock market from 1989. Courtesy of The Chart Store, here is more evidence that the Fed just pushed the day of reckoning forward a few months: the first charts the current NASDAQ market plotted over the Great Depression Dow, and the second plots the current NASDAQ over the post-1989 Nikkei market. This week we see the same game plan being worked once again: smash the U.S. dollar and juice the risk trade, as if the inevitable recalibration with reality can be staved off forever. Judging by these three charts, that recalibration will take about another two years. Perhaps when the stock market reaches its inevitable (i.e. unmanipulated) true value some time in 2013, then the Fed's attempts to fool Mother Nature will be seen for what they are: catastrophic failures. As we can see, The Fed's QE2 didn't change the future decline, it simply pushed it forward a few months: the current market has now caught up with the 1907 decline. With inflation rising and the markets falling, just how effective do you reckon QE3 or any other gambit will be in staving off reality? I am taking a break from posting and email. As I won't be reading correspondence for a number of days, I won't be able to reply to emails. Thank you for your understanding. "There isn't a shrewder and more insightful observer of the chaotic, swirling American scene than Charles Hugh Smith. If you are having trouble making sense of your culture, please buy this book!" "Less 'how-to' than how to think, An Unconventional Guide to Investing in Troubled Times is the perfect antidote to the smoke-and-mirrors groupthink that runs rampant on Wall Street. 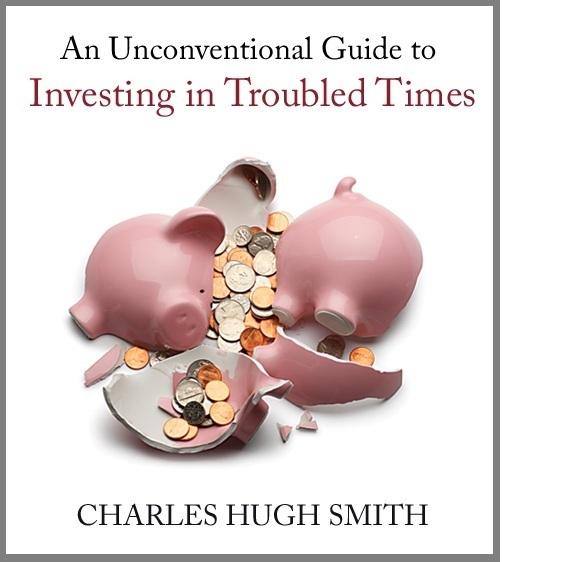 Chock full of insights on accumulating and preserving wealth in a rapidly-changing world, Charles Hugh Smith's latest book is a 'must have.'" "For anyone seeking an original, eye-opening, unvarnished and practical approach to the real New Normal, and the capital markets that accompany it, Charles Hugh Smith, one of the very few voices in the noisy wilderness of the financial Internet worth listening to, has just released this must read book for anyone who wishes to learn about the other, and more importantly correct, side of the story." "A masterful synthesis of essential insight and practical guidance. This Unconventional Guide explains why our economy and financial markets have reached a level of unsustainable systemic risk -- and how understanding the nature of the forces at play enables savvy strategies for securing 'wealth' (of all kinds) as the inevitable dénouement unfolds. Few authors write with the intelligence and heart that Charles does; fewer books empower the reader more to face the certain changes in our future with confidence." If you have some doubts about Wall Street's permanently Bullish "guidance," you might be interested in my new book An Unconventional Guide to Investing in Troubled Times, now available in Kindle ebook format. You can read the ebook on any computer, smart phone, iPad, etc.Click here for links to Kindle apps and Chapter One. Thank you, Sandra D. ($20), for your wondrously generous contribution to this site -- I am greatly honored by your support and readership. Thank you, Lawrence M. ($20), for your extremely generous contribution to this site -- I am greatly honored by your support and readership. Kindle ebook availability note: my ebook An Unconventional Guide to Investing in Troubled Times is currently unavailable due to some formatting issues which I am working to correct. I hope to have the ebook back online within 24 hours. Thank you for your patience. The Fed has yet to learn that you can't fool Mother Nature for very long, but it's about to get a punishing lesson. We have or will soon have 20-25 million unemployed people with few prospects for a job. This is a problem we cannot and should not dodge just because it's inconvenient to our cargo-cult political Elites. There is a low-cost solution that everyone will dislike. America has a systemic problem which it refuses to recognize because the usual Left-Right ideologies would all be revealed as complete failures. Here is the problem: there are 15 million officially recognized unemployed, and another 5 million zombie-unemployed who have dropped off the government's tabulation because they are politically inconvenient. The other half of this problem is that the nation's job-creation machinery is completely broken for structural reasons I have described many times, most recently in You Want to Create Jobs? Here's How (August 2, 2011) and You Want to Create Jobs? Here's How Part II (August 4, 2011). The hard reality is that the U.S. economy must be re-ordered from the ground up if we are to revive the job-creation machinery. This will require many systemic changes, the two key ones being A) breaking the death-grip of the top 1/10th of 1% financial/political Elite's grip on the throat of the economy and central government, and B) transitioning the entire economy from a bloated, inefficient, rigid, high-cost, crony-capitalist, monopoly/cartel-dominated, credit-based consumerist economy to a productive, capital/savings based economy based on the rule of law, community governance, individual rights and decentralized competition. The current model of pretend-Capitalism and extend-and-pretend debt consumption is falling apart due to intrinsic, structural reasons. Rather than add jobs, the U.S. economy will shed another 4 to 5 million jobs in the next few years. While our government will gerrymander the statistics, the bleak reality is that there will be between 20 and 25 million unemployed Americans with essentially zero job prospects by 2013/14. Neither the Left nor Right is willing or able to face this reality. This is because ideologues are like alcoholics; getting drunk every night "works" because it's easier than facing up to failure and wrenching change. Ideologues turn a blind eye to the failures of their chosen political faith because it's easier than facing their failure and having to toss their cherished ideological security blanket on the trash heap of history. The fervent proponents of Left and Right are all alike in cherry-picking evidence to support their own rigid orthodoxies and ignoring any evidence that the "big ideas" of their faith are not just failures in the real world, but actively pernicious and counter-productive. If we dare to set aside our ideological blinders for a moment, perhaps we can deal honestly with the reality that the job-creation machinery of the U.S. economy is fundamentally broken. Left and Right ideologues are in effect adjusting the rear-view mirror on a car with a blown engine, hoping that adjusting our view of the past will magically fix the destroyed engine. Reduced to their essence, the "big ideas" of Left and Right are: government control and spending fixes everything (Left) and lowering taxes and boosting corporate/banker/Wall Street welfare fixes everything (Right). The Bush Administration squandered trillions of borrowed dollars implementing the Right's "big idea," and the Obama Adminstration has squanderd $6 trillion of borrowed money pursuing the Left's "big idea." Both have undermined the economy and burdened future generations with a criminally large debt/claim on their earnings, yet all we hear from both camps of cargo-cultists is that we didn't do enough of their magic. They are just like alcoholics who are "gonna quit right after I get drunk one more time." It never happens, because they're in denial and can't bear the pain of their failure. The job machinery is broken for a lot of reasons, and most of them are not explicitly political. If you are unfamiliar with the concept of "the end of work," please read these previous entries to get an understanding of the global, systemic and technological reasons why the machinery which "worked" during the post-war boom no longer works. There are eight pages of entries on "the end of work" in my archives; just enter "end of work" in the custom search box in the upper left sidebar to view them all. What few are willing to discuss is what we as a nation should do with 25 million people with few job prospects in a broken economy. The economy could be fixed, but it will require from-the-bottom-up changes that will up-end all the Elites and fiefdoms which currently benefit from the Status Quo Central State/Cartel-Capitalism partnership. As a result of the immense power and resistance of these corporate cartels and Savior State fiefdoms, structural change is politically impossible. The only politically "possible" action is to keep adjusting the rear-view mirror on the broken-down car while chanting tired old incantations. The Right's cargo-cult fantasy is that cutting taxes will create 20 million jobs. The Right is beholden to cartel-Monopoly Capitalism, a.k.a. Global Corporate America, and Corporate America views competition as the one great evil that might limit vast profits. So it has enlisted the Savior State to decimate competition. Whatever can't be quashed is snapped up to preserve the highly profitable monopoly/cartel. The Mainstream Media loves to hype the story of three college kids who start a multi-million dollar Web 2.0 business in their cramped San Francisco apartment, but as I constantly remind readers, Twitter has about 300 employees and Facebook around 1,700. The reality is that Web 2.0 businesses are all about lowering costs (free software replacing employees) and attracting eyeballs, i.e. marketing, which pulls revenues from old-line media and causes cascading job losses in those industries. Life is good for the top 1/10th of 1% of America's entrepreneurs, but for real-world small business, prospects are bleak and getting bleaker: Shrinking in a Bad Economy: America's Entrepreneur Class. I often summarize the reality thusly: you have to be insane to start a business in the U.S., unless you're the proverbial smart kid with a Web 2.0 idea you can monetize in a few years and then sell to Global Corporate America for tens of millions of dollars. If the ranks of the jobless are set to swell by millions, and the job machinery is broken for reasons that are politically impossible to fix, then where does that leave the 25 million unemployed, and where does it leave the nation? I have a solution, but since it's practical and doesn't fit every ideologue's narrow view, then everyone will find plentiful reasons to dismiss it, Left, Right and Libertarian alike. So then the question to ideological purists is: what's your solution? Doing nothing doesn't work, cutting taxes doesn't work, and propping up the Corporatocracy with trillions in Status Quo Savior State spending doesn't work, either. The London riots have triggered avalanches of hand-wringing, stern lectures and pontificating, and at the risk of oversimplification I think we can boil the riots down to a simple but profound concept: the disenfranchised no longer have a stake in the Status Quo or in their communities. Here is the ugly truth about the Savior State, welfare state, social welfare state, or whatever you choose to call the Central State: The Savior State displaces and destroys community and social capital. By making individuals dependent on the Central State for free money, free food, free housing, etc., then the State has taken over the natural function of community. Being part of the community is no longer a requisite for social capital, employment or meaning. Free money is not a positive, it is a force of destruction for the individual and the community. One thing I have noticed about ultra-orthodox Liberals/Leftists: they are rarely self-employed in the private sector, rarely own a small business with actual blue-collar/pink collar workers, and they have little actual experience with the systems they ceaselessly hype as "positive solutions": unemployment lines, emergency rooms, applying for SSI, a.k.a. "crazy money" permanent disability from Social Security, Section 8 housing, food stamps (SNAP), finding a doctor to extend your workers compensation stress claim, or any of the other ways that the "poor" either navigate the system or game it. The Left's cargo-cult fantasy is that giving tens of millions of people free money is going to "tide them over" until some magical return to 1999 occurs and 20 million jobs arise out of nowhere. Since nobody on the Left has ever started a small business or hired anyone, then the job creation that will someday arrive to save us (cargo-cult!) truly is inexplicable "magic." On the Right, most of the cheerleaders of lower taxes/cartel-capitalism/Central State spending on Global Empire, etc., are safely perched in some protected fiefdom sucking off the very State they piously deplore. Very few have started and operated a small business from scratch; those few who claim business experience usually inherited the business from their family. Thus both sets of ideologues are like car owners who are anxious to tell a mechanic how to fix the blown engine even though they've never even picked up a wrench or changed a spark plug. Here's the deal with humanity: we will exploit whatever windfalls are offered to us.Windfall exploitation is a key concept in Survival+, and it is value-judgment neutral, meaning that it is a trait that has been selected as extremely helpful; saying it's "good" or "bad" is meaningless. Left and Right ideologues turn a blind eye to the windfall exploitation that doesn't fit their views. If I am a very wealthy person, and I can invest $300,000 in tax attorneys and shell companies that save me $3 million in annual taxes, then that is a windfall I would be foolish to pass up. If I an CEO of a Global Corporate America company, and spending $3 million in campaign contributions will reap my firm $300 million in tax breaks or government contracts, then I would be foolish to pass up such a windfall. "Poor" people are no different; if being "poor" is incentivized, then remaining "officially" poor is a modest but very real windfall. If being a single Mom is incentivized, then the obvious choice is to avoid marriage to collect the windfalls that flow to single moms. If workers compensation can be gamed via a "stress claim" for a long "free" vacation, then it's foolish not to exploit the windfall. The Right is blind to the windfall exploitation of the financial Elite, and the Left is blind to the windfall exploitation of those with access to Savior State free money. Those of us with actual experience in blue-collar/pink-collar America and "poor" communities are keenly aware of this because we know dozens of people who are scamming the system. The tragedy of "free money" is that the subtext of this "help" is so perversely negative. When you get free money or equivalent, rather than an opportunity to contribute, what you're being told--and recipients understand this quite well--is that you're not worth any real investment or effort. The "free money" is a bribe to keep quiet and invisible. Those skimming the benefits of the Status Quo don't want you pestering them or upsetting the apple cart, so they give out enough free money and goodies to buy everyone off, making them complicit in the whole rotten system. The real message of free money is this: you're worthless. And because we're designed to take free money, or free anything, we take whatever's free: the $3 million tax break, the $300 million government contract, or the food stamps and unemployment. But there is a cost, of course: in taking free money from the Savior State, as corporate or individual welfare, we have sacrificed our autonomy for our yoke of dependence on a disembodied, distant State. If we want to get 20 million people back to productive work, we need to incentivize productive work and stop incentivizing unproductive gaming the system. I already laid out some structural steps in You Want to Create Jobs? Here's How (August 2, 2011) and You Want to Create Jobs? Here's How Part II (August 4, 2011), but these are all politically "impossible" at this time. Maybe in five years things will be different, but in the meantime, what do we do with 20-25 million people with nothing to do? Answer: we put them to work. Before I describe how, let's be honest about how destructive it is to sit at home doing nothing, contributing nothing and being utterly unproductive. People who are denied a chance to contribute and be part of their community are unhappy people. People without productive work are so unhappy that many people who retire to an unproductive life simply die. I think the evidence is profoundly obvious that paying people to sit at home watching the telly is profoundly destructive. It is no wonder that people paid to do nothing, people dependent on the Central State for handouts, are filled with resentment; nobody likes to be worthless or dependent, and yet this is precisely what "free money" does to the human spirit. Free money destroys the value of social capital, community, and the fabric of community, which is responsibility and reciprocity. With Free Money, there is no need to engage in social capital building, because the State check comes regardless. There is a deeply pernicious political agenda to free money: it atomizes people, and this makes them much easier to control. By issuing individual checks and benefits, the Central State has set up a diabolical social Darwinism, in which competition for entitlements creates a dog-eat-dog environment in which community is discounted to zero and gaming the centralized State bureaucracy is highly rewarded. Once you discount community to zero, it unravels. Poverty is not just a lack of money, it is a lack of social and human capital, a topic I address in An Unconventional Guide to Investing in Troubled Times. The only way to restore value to community and social capital is to require every recipient of State welfare/free money/free benefits to contribute time and effort to their community, and cut off the benefits/free money if they choose not to. With choice comes responsibility. Since we're giving people free money and free goods/services anyway, why not enable them to be productive, build social capital and keep their skills sharp, or learn new ones? The net additional cost is essentially zero, as all we'd be doing is leveraging systems which already exist. This is not "national service," because it's not controlled by the Central State. It is a form of "workfare," which is positive for the individuals being given the choice. Why is workfare positive for the unemployed? The best way to acquire valuable skills and valuable social-capital contacts is to enter the workforce and start doing something productive. Once a person is needed, and contributes something positive to their community, their self-worth rises and the community gains the benefits of their labor. The transition from incentivizing doing nothing to incentivizing productive labor on behalf of community will be difficult for many; even though it is terribly debilitating to sit at home doing nothing, it is certainly "easy," just like it's easy to live off government contracts (corporate welfare) as opposed to actually having to compete in the real world. We don't need to reinvent the wheel to put 20 million people to productive work in their communities. There are a million churches, community groups, non-profits, service clubs, garden clubs, etc. in the U.S. (not to mention state and National Parks desperate for motivated volunteer labor). Giving 20 million unemployed a choice of places to contribute to their community would eventually distribute about 20 people on average to each organization. The vast majority of these organizations are already set up to put volunteers to work. They already exist; there is no vast machinery to invent at the Savior State level. The decentralized machinery already exists to do everything that Global Corporate America can't do for stupendous profits. As cities, counties and states trim their workforces to align expenses with their tax revenues, then community tasks like maintaining parks will devolve to volunteer groups. Rather than pay 20 million people to sit at home doing nothing, why not engage them in their community, and get them back into the positive world of contributing and being valued? Those collecting food stamps and Section 8 housing can also contribute, in proportion to the benefits they're accepting. Free anything is debilitating, and it's crazy yo be giving tens of millions of people money to contribute nothing while the nation falls apart out of neglect. Global Corporate America will only do and only go wherever it can reap staggering profits; that is its raison d'etre. Thus most of the real work of the nation is of zero interest to Global Corporate America and its politico toadies. Corporate profits: $1.4 trillion, or 10% of GDP. The Free Money programs: extended unemployment: $160 billion, SNAP food stamps: $60 billion, Section 8 housing vouchers: $10 billion, total around $230 billion, or 8.4% of annual Federal spending of $3.8 trillion, and less than 2% of GDP. Let's be honest: it's easy to pay people to do nothing. Requiring people to be productive is fraught with challenges: liability issues, oversight, lack of training, and a thousand other problems. It's easier to pay people to do nothing than give them an opportunity to contribute and improve their skills and social capital. That's too bad, because the machinery is already in place: we already have a vast system in place for teaching new skills called adult education and community colleges. We have a vast decentralized system in place to serve and nurture communities (community and non-profit organizations), which are ultimately the lifeblood of the nation. We already have a bureaucracy in place with systems for tracking and monitoring unemployed people called the state unemployment system. Paying people to be idle and unproductive is destructive and debilitating; giving them a chance to contribute and become valued would be hugely positive, for the idle and for their communities. The message would change from: you're worthless, just stay home and fade away, to: you are too valuable to pay to sit at home doing nothing. I know this idea goes against every ideologically pure ideal out there; it is simply too practical, too cost-effective, too positive and too unrewarding to Central State fiefdoms and Global Corporate America cartels to gain any support from the financial and political Elites. So instead we'll watch our Elites fiddle with the rear-view mirror to "fix" the jobs machine which has a blown engine and frozen transmission, and as the unemployment lines lengthen by millions, we'll continue paying people to sit at home rotting away and feeling worthless while the country falls apart at the seams. And why? Because it's easier than giving them a chance to be productively useful by contributing to their community. Thank you, James O. ($100), for your outrageously generous contribution to this site -- I am greatly honored by your support and readership. Thank you, Damien D. ($100), for yet another astoundingly generous contribution to this site -- I am greatly honored by your ongoing support and readership.